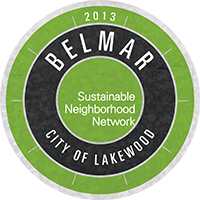 Click the Learn More button next to each of our goals to see how we plan on achieving sustainability in Belmar. Our energy goals are to promote energy efficiency in the neighborhood and encourage the use of renewable energy resources. Our air goals are to reduce emissions generated in the neighborhood and improve both outdoor and indoor air quality. Our water goals are to conserve water resources and improve water quality. Our land goals are to encourage stewardship and conservation of ecosystems and resources. Our goal within the community is to enhance social vitality of the neighborhood by encouraging community interaction, partnerships, and outreach programs.